Rev. 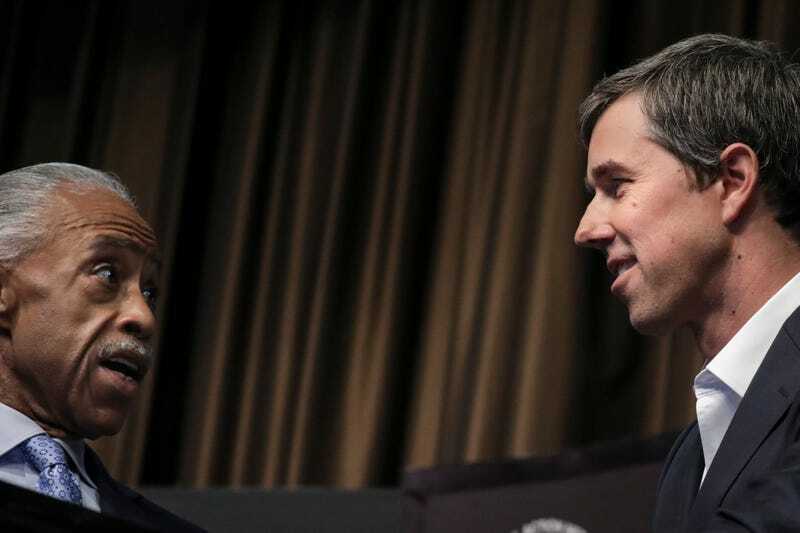 Al Sharpton (Left) speaks to former U.S. Representative and Democratic presidential candidate Beto O’Rourke at the National Action Network’s annual convention, April 3, 2019 in New York City. Thus far, the list of Democratic candidates who could very well be our next president is lengthy. Bernie Sanders has returned from the grave to throw his name back in the hat, Cory Booker has proven himself a viable candidate—or not, and Kamala Harris has been spreading the gospel of truth, leadership and optimism wherever she goes. But with the presidential race so crowded, these hopefuls have been pulling out all the stops to stand out from the crowd. And one such increasingly popular method of doing so is broaching the controversial topic—that shouldn’t be a controversial topic—of reparations. During the National Action Network convention in New York City, former U.S. Rep. Beto O’Rouke was asked by Rev. Al Sharpton for his 2 cents on the matter. And apparently Texas’ pride and joy is Team Pay Them Niggas. “Absolutely I would sign that into law,” he added, to raucous applause. But just a month ago, while campaigning in Iowa, wasn’t he wavering on the same issue? To be fair, he admitted “the country needs to address its grim history with respect to racism before any repair can take place”, but he wanted no parts of openly lending his support to legislation in favor of reparations. However, it appears he’s made an about face—only after the likes of Sen. Elizabeth Warren and former Housing and Urban Development Secretary Julian Castro have long since waved that flag. Again, his words. Not mine. But before discussing reparations at NAN on Wednesday, he declared his opposition to the war on drugs, for-profit prisons and our country’s cash bail system. According to Huffington Post, O’Rourke was the first of more than 10 presidential candidates scheduled to speak at the convention, with Sens. Kamala Harris, Cory Booker, Bernie Sanders and Elizabeth Warren slated to appear on Friday.